The market consolidated its recent gains with both prices and turnover declining from those of the prior month. 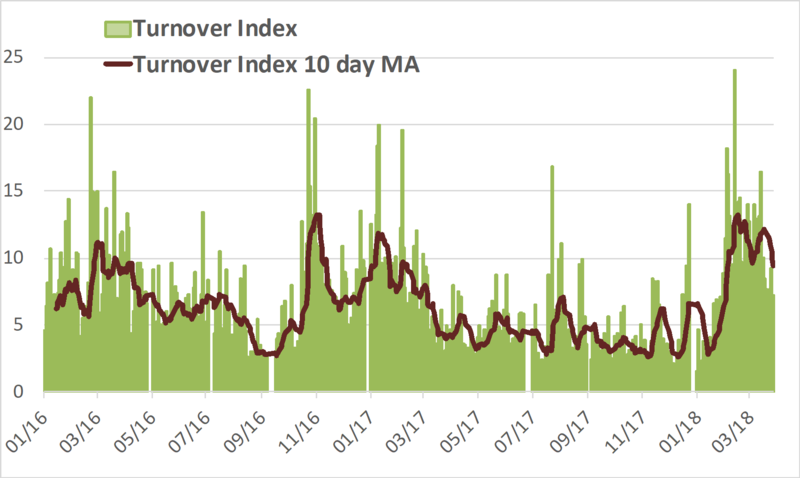 Average daily turnover declined by about 15% from that of the prior month with the second half of the month seeing even bigger declines in daily turnover (see chart below). The decline in turnover was paced by declines in the overall market with the RSISUSD Index down -2.6% for the month and up 16.9% YTD. Foreign buying declined significantly from the strong pace of the prior month but remained consistent and at relatively high-levels in contrast to the on-off buying patterns of last year. 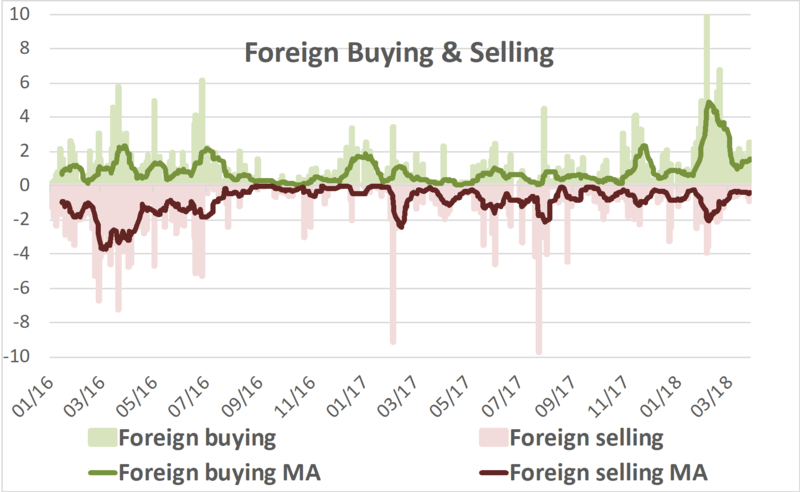 Foreign selling dropped to the lowest level over the last 12 months (see chart below) which taken with the continued buying, implies that the Iraqi equity market is still in the early phases of foreign inflows. 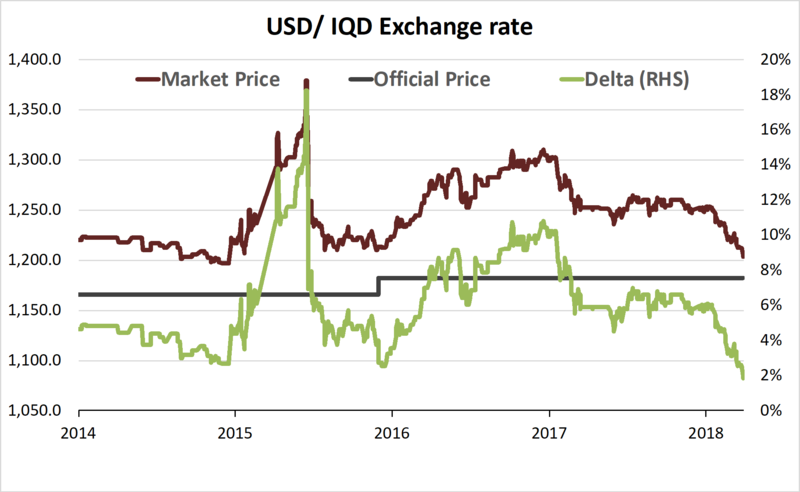 A great deal of this recovery is related to the recovery in oil prices and thus government finances that began in November 2016 as evidenced by the gradual decline of the premium over the official exchange rate from 10% in November 2016. The first visible beneficiaries were the country’s foreign reserves held with the Central Bank of Iraq (CBI), which increased to over USD 50bn by March vs USD 45.2bn at end of 2016, and the IMF’s estimates of USD 41.5bn by end of 2017. This was driven by less need for indirect monetary operations by the CBI to finance the budget deficit given improved government finances. 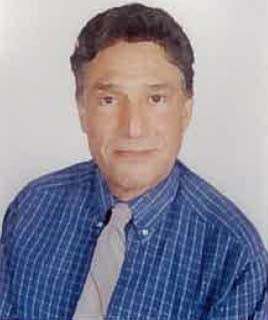 The improved finances were manifested through the flexibility gained by the changed dynamics of oil prices, which over the course of the last 12 months had a sustainable positive effect on these finances as Iraqi oil prices averaged about USD 49/bbl throughout 2017 vs. 2017 budget assumptions of USD 42/bbl, and YTD averaged about USD 61/bbl vs 2018 budget assumptions of USD 48/bbl. This was first expressed through a smaller budget deficit and thus less of a need for indirect monetary operations by the CBI and less borrowings, which should lead to greater flexibility for the government to allocate more resources to reconstruction and capital spending. Given the centrality of government expenditures to the economy and the declining cost of the ISIS war, the improved finances should be reflected by a return of liquidity to the economy, but, this is yet to happen. 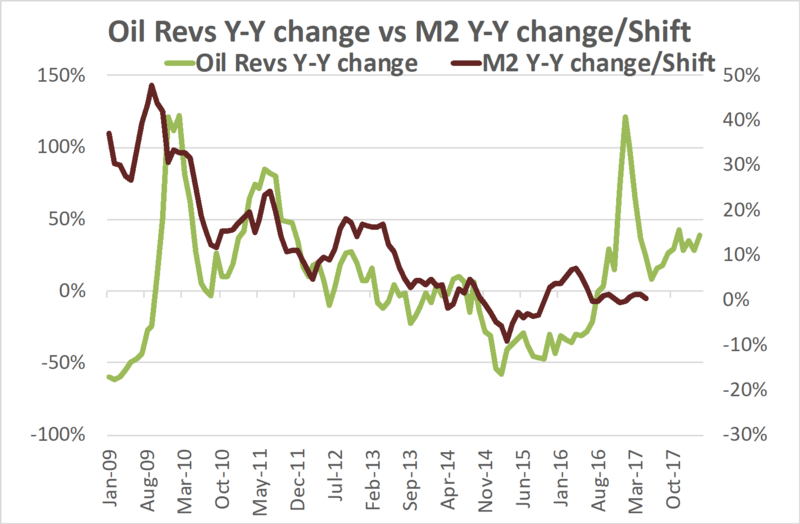 Historically the observed time lag between Y-Y changes in oil revenues and Y-Y changes in M2 has been about 7-9 months which suggests that M2 growth should see improvement over the next few months as the chart below implies: it shifts the Y-Y percentage change in M2 back by 9 months versus the Y-Y percentage change in oil revenues. However, this is complicated by the uncertainties and government paralysis ahead of the parliamentary elections on May 12th which will likely delay this recovery. The increased liquidity in the form of both local and foreign inflows reported over the last few months needs to be maintained for the market’s consolidation to lead to further recovery, and for this recovery to be sustainable. 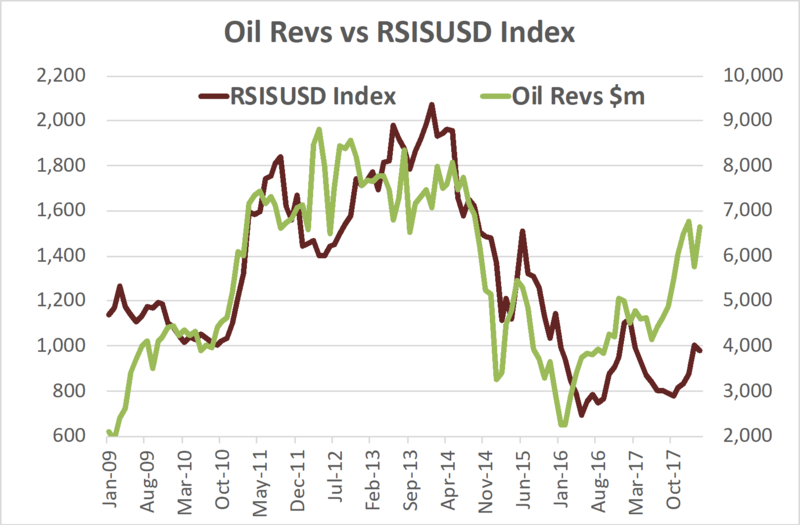 The backdrop continues to be positive as the sustained improvements in government finances should ultimately lead to better market action: historically the equity market, as measured by the RSISUSD Index, has tended to follow the improvement in government oil revenues with a time lag of 3-6 months as the chart below shows. Given the time lag involved and the election uncertainties, this will likely unfold over the next few months and the recovery will likely be in fits and starts with plenty of zig-zags along the way. This continues to underscore the opportunity to acquire attractive assets that have yet to discount a sustainable economic recovery.